I thought I would get back into the swing of blogging by doing a fun, multipurpose post! We have had so many life changes happening lately that my short term goals and things I want to do have felt really jumbled. I'm a huge list person and generally keep a daily to-do list in a notebook and a weekly/monthly schedule in my planner but I usually reserve those for things like "get car inspected", "phone bill due", or "buy water". 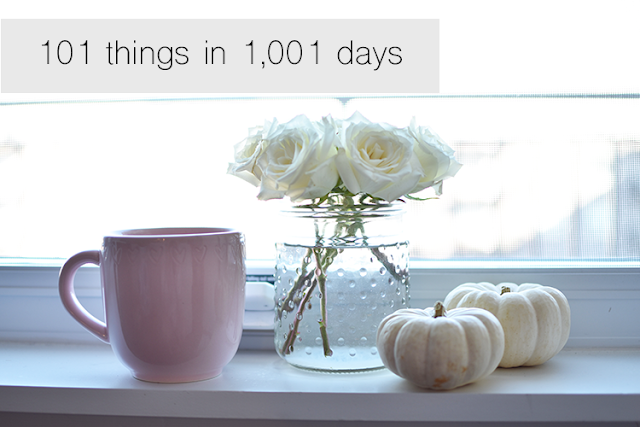 So, the purpose of this list of 101 things is to have a physical reminder of things I would like to accomplish in the next 1,001 days (roughly 2.75 years) and by publishing it here I have a community to keep me accountable! Some of these are rather small things that I've been meaning to do for a while and some of them are huge goals that are going to be really meaningful to cross off. 79. go to Waco to see The Silos, Magnolia Bakery, etc. I'll be giving this list a permanent home on my navigation bar so I constantly see it and you can check in and see what I'm crossing off my list! If it's a huge milestone, I'll be doing an accompanying blog post which I will also link on this list.